Guinevere had her first round of immunizations today. She was given DTP, HIB, Polio, Rotavirus, Pneumo and Hep B . . . don’t ask me what any of that stands for because I don’t honestly know. All I know is that seeing my daughter’s little face all bright red and scrunched up in pain made me so much more emotional than I anticipated. I really didn’t intend to cry, but I did. Somehow I thought I would go in there and hold her hand and tell her to be a brave girl, even though she can’t really understand me yet. 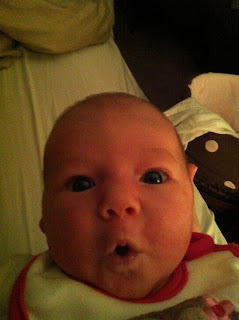 But somehow, I think I ended up being more emotionally scarred than my 6-week-old daughter. Ok, that may be a slight exaggeration. It wasn’t horrible. In fact, it was over very quickly. After the nurse finished giving her the shots, I picked Guinevere up to comfort her. She calmed down in my arms – it kind of melted my heart. She doesn’t always calm down when I hold her, but I will admit that it makes me feel like a good mom when I go to comfort her and it works! Since we got home, she’s been alternating between napping and waking up crying in pain; then the cry dissipates into this pitiful little whimper and she falls back asleep. Other than the shots, the appointment went well. Guinevere is now 8 lbs 12 oz and 21 ¼ inches long. She’s already outgrown a couple of my favorite newborn outfits. You should see the cute little outfit we brought her home from the hospital in – it’s way too short on her now. It makes me sad and proud all at the same time. However, I am very excited to be able to start putting her in some of the adorable 0-3 month onesies that were so ginormous on her just 2 weeks ago. 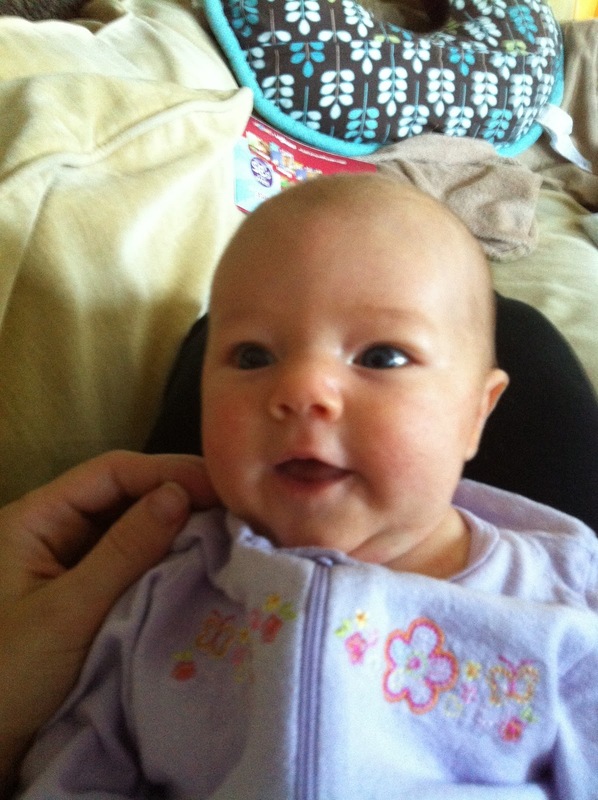 In other news, Guinevere has started to smile and coo. My sister visited from New York this week, and every time Guinevere would smile or coo at us, we would squeal with delight, which of course, made Guinevere smile even more! Unfortunately, she tends to smile the most when there’s no camera at arms reach. So of course, one of us runs to grab the camera and by the time we get back, she refuses to smile. We’ve found that she tends to smile the most in the morning (I am secretly pleased to have a morning person daughter . . . though I guess it’s not so secret now that I’ve just posted it for the world to see). She also seems to smile a lot on the changing table. I’m guessing it’s a combination of a) being up closer to our faces and b) knowing that she will soon be clean and dry. My happy girl this morning. Nights are also starting to get better (though I always feel nervous saying that, like I’m tempting fate or something). She even let me sleep a full 6 hours three nights this week! Most nights I’m not that lucky, but she has been pretty good about going back to sleep after waking for her 3 am feed. Honestly, that’s the most important part to me. I have pretty much adjusted to the new reality of sleeping in 3-hour increments. I am now able to wake up from a normal night like that and feel relatively rested. It’s the nights when she refuses to go back to sleep at 3 am that are the worst. I can’t quite decide if it’s more frustrating when she’s fussy at that hour or super cute. There have been a couple nights when she wakes up at 3am and then is all smiles. I feel so bad trying to get her to go back to sleep when it seems like she wants to be all bright and sunny and awake. At least when she’s fussy, I don’t feel bad telling her to go back to sleep. But I guess of all problems to have, that’s not a bad one. One issue I would like to put out to the world: Guinevere seems to hate tummy time. The pediatrician told me we should be giving her more tummy time than we are, but every time we put her down on her tummy, she starts screaming. Does anyone have any tips on how to get her to like it? Or at least do it without crying? I’ve tried laying down next to her on the floor and encouraging her, or trying out different toys to see if any of them take her fancy, but nothing seems to work . . . yet.